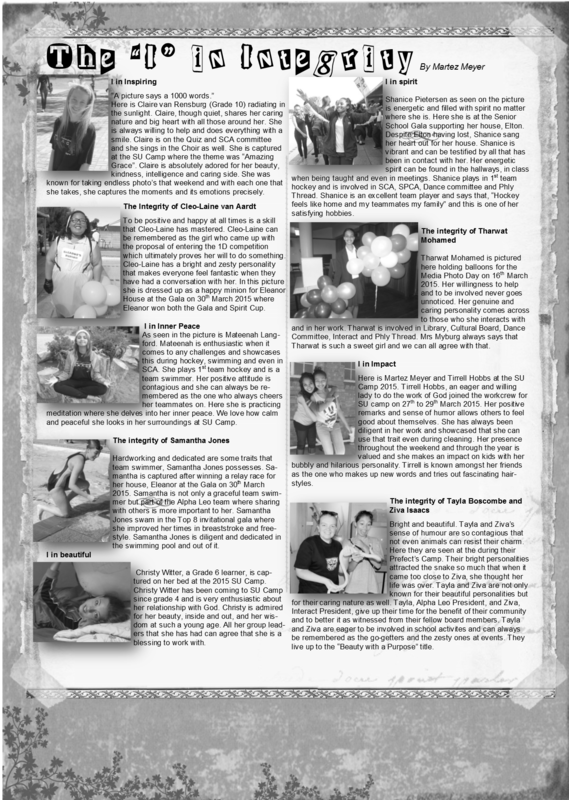 Comment on our blog topics here. Join our positive community discussion. Comments will be moderated before appearing. Do submit a good luck message for the matrics or tell them about your best memories of them. All of the best with the Finals and for the future. You are all capable of reaching great heights. 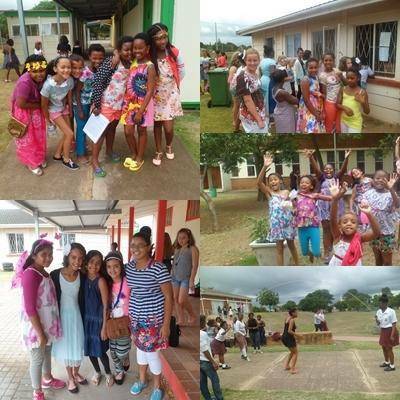 What memories of Riebeek in 2015 or before will you be discussing as you visit your Old School as an OLD GIRL? The first three lessons were a bore, and as I was sitting in register class, with my eyes barely open, I looked back in hindsight and realised that watching the late night movie after completing my homework was not a good idea. Oh, how I loathe the necessity of sleep! When the breakbell finally rang, my classmates rushed into the corridor, similar to the way we would excitedly push each other out of the doorway when we were in Grade 1. I guess break is the best part of the schoolday for learners of all ages. It was almost 32°C that day and it felt as if I would collapse onto the ground before I reached my friends’ usual spot. However, I managed to drag my feet to the shady spot I usually sit in. I slumped down with a loud groan. Despite my agitation, brought on by heat and sleep deprivation, I was eager to see my friends and tell them about a really funny joke I saw online. But as the conversation progressed, the joke completely slipped my mind. I would not make it through the day without nutrition. I pulled my lunch out from my bag and was once again disappointed by the remarkable monotony and predictability of a cheese and tomato sandwich. I tapped my shirt pocket and heard a cheery jingle. I had just enough coins to buy myself some sour jelly beans (my favourite). Though the walk to the tuckshop drained me of energy with each step I took, and the queue was restless and seemingly endless, I had retrieved my small, colourful, tasty treasures and it was worth it. I was enjoying my friends’ crazy, hilarious, bizarre stories, when the dreaded sound of the bell banged against my eardrums, signalling the end of break. My friends and I reluctantly stood up and picked up our bags. We greeted each other with smiles and see-you-laters and reported to our respective classes. Second break could not come fast enough! If you are an Old Girl, what memorie do you have of break time? If you are a present Riebeek Girl, what do you do at break? What are your RIEBEEK 2015 RESOLUTIONS? Tell us a bit about your plans, hopes, fears and resolutions for the splendid year that 2015 will be at Riebeek.  I am really looking forward to the year ahead and I am so thankful for being given the opportunity to participate in so many cultural activities. I am also really excited to build my leadership skills. When the Grade 4s were asked what they like most about their new school they replied with a multitude of answers such as sport, Stay-Awake, the helpful teachers and the new friends they have made. Of course, there are always those gut clenching moments and the first day at a new school is no exception. On arrival the Grade 4s did not know what to expect, the matter of being the babies at a new school after leaving their Grade 3 kingdom must have been a change. They were met with new, loving, caring teachers that helped them with all their problems no matter how big or small, but when asked what they found most intimidating it wasn’t the subjects or the work load but the seniors. As the Grade 4s sat and watched the seniors walking around what they, on their first day, knew to be an alien school, their expectations grew to unimaginable heights. 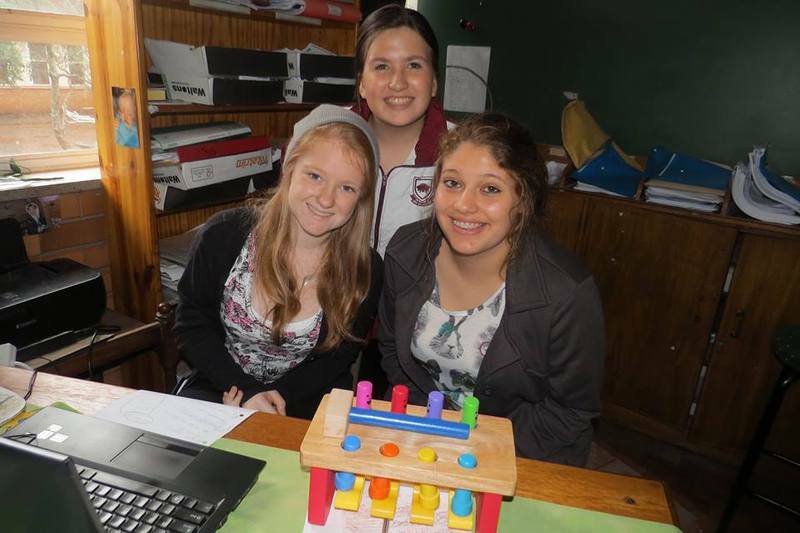 When asked what goals they were setting for themselves to achieve before they leave Riebeek they replied prefects, named every committee, said they wanted to rule the school, but at the end of the day the one thing they want most is to just have fun. What does it mean to be a grade 10? A day in the life of a grade 10 is very uneventful indeed. A mad dash to school and a clumsy sprint to the first lesson starts off our uneventful day. When you reach the first lesson before the first bell has rung you breathe a sigh of relief and gratefully sink to the floor to animatedly inform your friends of yesterday’s events. However, your eyes wonder to the open books and notes encircling your friends and they ask the dreaded question, “Have you done the homework?” Your heart sinks to the floor and you frantically start scribbling down answers which you know are wrong. Just as you see a light at the end of the tunnel, you hear the words “Ladies, please get out of the corridor!” echo mercilessly in your ears. When first break finally arrives, you collapse in heap in the nearest available shade and seriously reconsider your subject choices. You already have your new subjects in mind when all too soon the bell rings and the screech of the siren pierces your ears as you prepare for round two of lessons. By second break you have already re-evaluated what you’re going to do with your life and have decided that because you are going to drop your subjects there is no need to do the mountain of homework you have been assigned. Who needs to study for a test when you’re going to drop the subject tomorrow? Yet again, the bell sounds and you gracelessly stand up in preparation for the knockout blow in round three of lessons. The final bell sounds and you gleefully shove all your work into your bag before flinging it around your shoulders. You stride out of the gates towards freedom and give not a second thought to the worries that have been plaguing you throughout the day. You then repeat this cycle for the next day”¦ and the next”¦ and the next. So as you see, a day in the life of a Grade 10 is quite uneventful indeed. On the first day of Grade Nine I couldn’t help but smile because we weren’t the babies of the high school anymore. We made it past the first hurtle, but then reality set in. Grade Nine was going to be fun, but it was not going to be easy. We were warned by the Grade Tens and Elevens that if we thought that Grade Eight was tough; we would never survive grade nine. We thought they were joking or trying to scare us, but two weeks in and I was dead sure they weren’t. Grade Nine went on the attack all at once, like a train smash. We had projects coming and going like rockets, essay ideas popping into our dreams, we were reciting the periodical table as if it was our favourite song and homework”¦ homework every day. School work was much and hard, sport time consuming and social lives building up. Though our plates were full we still somehow found the time to attend the societies fair and jot our names down at each available table. We found time to attend movie nights, dances and coffee bars all the while managing to find time to sleep in between our television series. 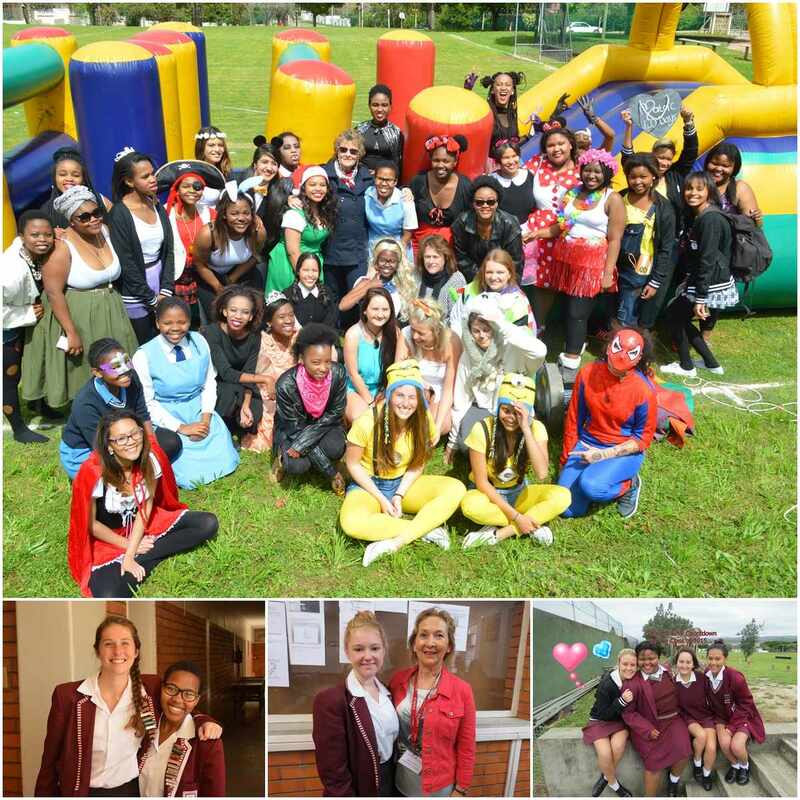 I found this mind blowing: Riebeek was not just teaching us how to be ladies, but also how to be multitasking superheroes! When we left Grade Eight and arrived in Grade Nine, we knew it would be more difficult. What we didn’t realise is how much our mind set had to change. We could no longer leave boat loads of homework for the morning before class or use the excuse: it was my dog, I did the work he just ate it. No grade nine was a completely different ball game and excuses are not going to cut it. To all the juniors and Grade Eights, listen to the warning signs, they’re there for a reason. Don’t stress yourself out, just take a deep breath, do what you have to do, socialise on the weekends only and you’ll fly right through. What are your thoughts on Grade 9? What are your thoughts on the new design of our website? MARTEZ MEYER WON THE MEDIA CLUB AWARD FOR HER WORK ON AN ASSIGNMENT TO WRITE ABOUT INDIVIDUALS WHO DEMONSTRATE INTEGRITY AND TO PROVIDE A PHOTOGRAPH DEMONSTRATING THIS QUALITY. Tell us about the best parts of 2014 at Riebeek.  The best part was having the Induction dinner. It was my personal favorite. Having everyone dress up and the tea party made me feel so special.